There is no way to warranty a product of nature. Great care is taken in the assembly of wood planks by using a combination of biscuits, dowels, and marine grade epoxy. The wood planks used are double kiln dried, which is more expensive but better insures against bowing. Clear grade wood signs are solid, have a look like no other, and when installed properly will give years of use. Primer seal may be broken (ie- a landscaper kicking a rock from a mower), which allow outdoor elements to deteriorate the wood. It is very hard to detect such, so routine inspections are required to protect the investment. Usually refurbishing is necessary every 5 years or so and can cost almost as much as a new sign. In addition, refurbishing can take a couple weeks leaving you WITHOUT A SIGN!! This newer material has entered the marketplace and provided for a much more durable and dependable product when wanting a sandblasted sign. And the best thing of all is you really can’t tell it’s not REAL WOOD unless you touch it and feel it!! It’s called High density urethane foam. High density urethane foam allows for infinite shapes and dimensional relief techniques, resulting in the most innovative business signage found in today’s competitive marketplace. A waterproof sandblasted sign has an elegant, handcrafted look that instantly sets it apart from other types of custom signs. The rich dimensionality and craftsmanship of a sandblasted sign creates an eye-catching appeal that distinguishes it from non-dimensional custom signs. Sandblasted signs have experienced a growing demand recently. 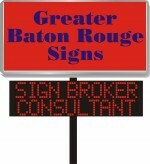 There are many sandblasted sign companies specializing in the custom design and construction of sandblasted signs, but the factory sources Greater Baton Rouge Signs recommends for HDU signs are the best available today in the market because they are built to withstand years and years of outdoor durability. Our HDU signs are waterproof and unaffected by temperature or climate. Our sandblasted signs are truly unique – no two are the same. The nature of wood and stone varieties ensures that each sandblasted sign is different than any other HDU sign in the world. We target signage solutions that fit your budget and needs. All designs are submitted to you for approval before production begins. Most sandblasted and dimensional signs are finished within 2 – 4 weeks. Completion time is dependent on overall complexity, size and workload at the time. Quality is the utmost importance to us. We stay in touch with the factories, working hard to get your sign done as quickly as possible and provide an estimated completion date when you order. “HDU” is short for high-density urethane foam. It is a material expressly designed for the sign industry. Unlike other foam with which you may have experience, HDU consists of more solid and less air. Urethane is a specialized material that it is unaffected by all petroleum-based solvents. Even in its “raw” state, it is completely waterproof and unaffected by temperature and climate. A HDU sandblasted sign is impervious to water. Water and moisture cannot get under the finish and cause material break down. HDU sign foam, unfinished is warranted for 10 years, indoor or out, against deterioration, warping, and cracking. It is 100% waterproof, not affected by temperature, and will not rot or decompose. Sign Foam will not warp, crack, or bow like solid wood when exposed to the elements. It is slightly lighter than wood, which might be a consideration when hanging a sign, and the lighter weight saves in shipping. Sign foam can be blasted with a simulated wood grain finish that, in most cases, looks better than a real wood grain. Sign foam is slightly flexible, which might cause problems on long, narrow signs. If a dimensional sign is going between posts or in a situation where it might take abuse from wind or pedestrians, consider having us laminate a backing for reinforcement. In case of some special requirement, do let us know how you plan to mount your sign so that we can work with you to ensure no problems are encountered with the HDU sign installation. Contact one of our sales staff members today to find out more information, or feel free to send an email for an estimate.